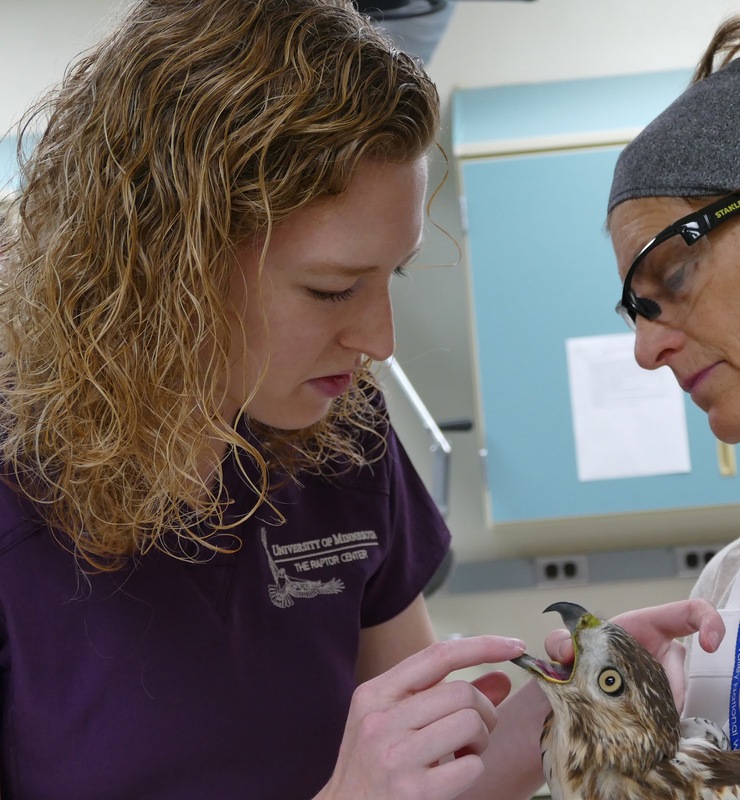 Dr. Dana Franzen-Klein with a red-tailed hawk patient. We would like you to meet TRC's veterinary resident, Dr. Dana Franzen-Klein. She wrote a few lines about herself. As you can see, she is a perfect fit with TRC, and we look forward to working with her. I grew up in northeast Iowa, completed my undergraduate studies at Luther College, and graduated from the University of Wisconsin-Madison School of Veterinary Medicine in 2013. During veterinary school I spent time at the National Wildlife Health Center, the International Crane Foundation, the San Diego Zoo Safari Park, the Indianapolis Zoo, and the Georgia Sea Turtle Center in order to learn more about wildlife medicine. Immediately prior to coming to The Raptor Center, I spent a year as the veterinary intern at the Wildlife Center of Virginia. I am completing a three year clinical residency and a master’s degree program during my time at The Raptor Center. The Raptor Center is a world renowned leader in clinical avian medicine, and provides an ideal learning environment. I am passionate about wildlife rehabilitation, and very much enjoy that aspect of my work. The Raptor Center also devotes time to wildlife conservation and public health focused research, which is an area I want to become more actively involved in. Education is a vital component of wildlife conservation efforts, and I admire the educational component of The Raptor Center’s mission. The Raptor Center provides educational opportunities not only for the general public, but also for veterinarians, veterinary students, and wildlife rehabilitators. I am very grateful to have the opportunity to learn from some of the best clinicians and scientists in the field. I am looking forward to building my clinical skills, improving my teaching abilities, and developing my research skills.